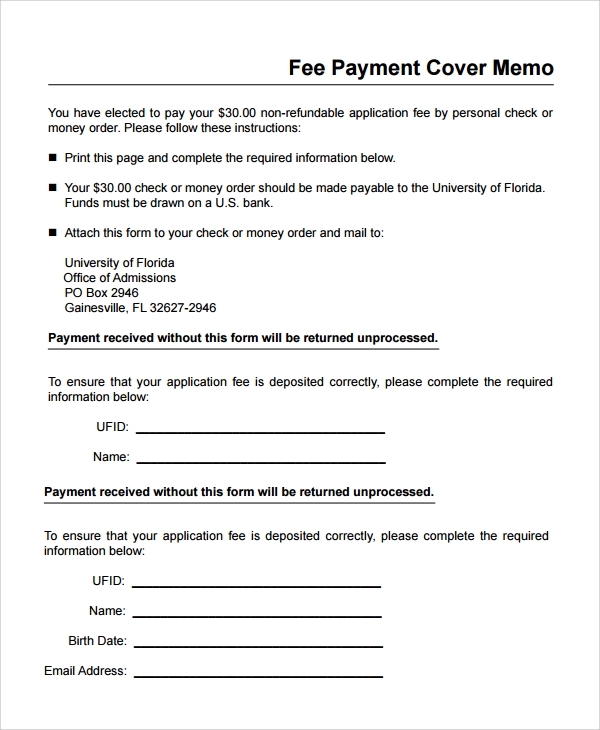 If you are releasing a memorandum letter, you definitely need memo templates. 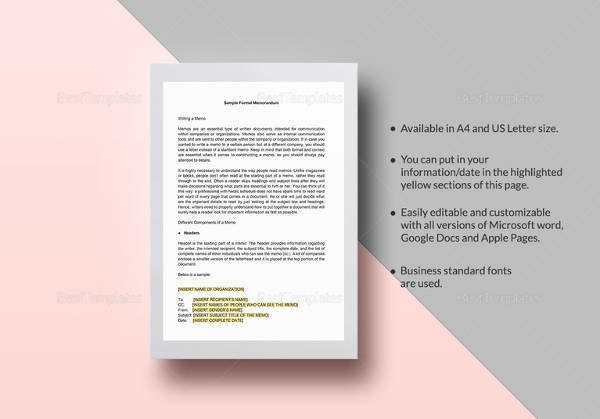 This is a special sheet or document that intends to inform a group of individuals regarding a specific issue like policy, event, resource and encouragement. Now you can create an effective memorandum to keep in mind or to remember. 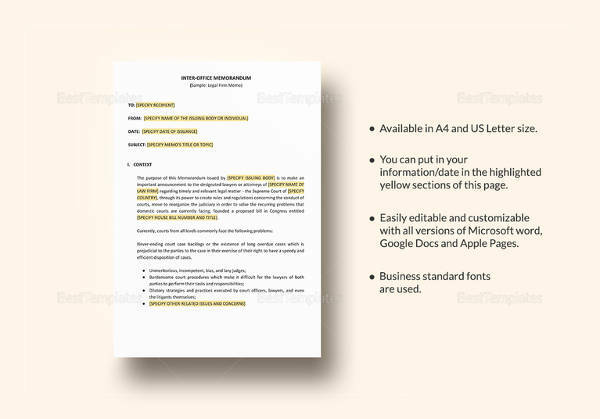 This type of memo template is issued by the office of the army. This is to send memorandum from the headquarters of the army to the army officials. Also, the headquarters of the army would declare announcement or policy that the whole department must be aware of. This memo letter is signed by the sender and even by the head of the army group. 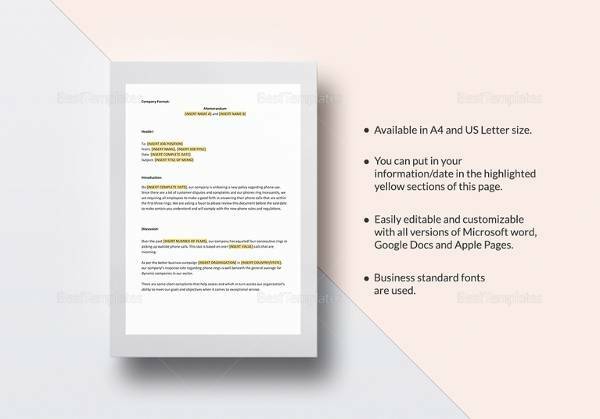 This memo template is designed for businesses. 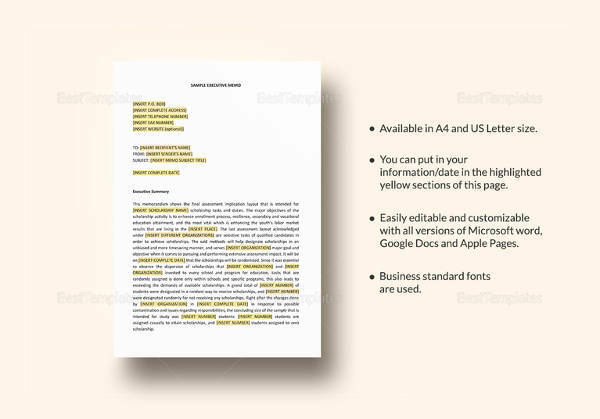 This memo letter serves as a letterhead for sending external communications. This is use to deliver instructions or information and becomes a part of an organization. A company general memo is vital and must be delivered to the institution. This memo template is extremely applicable to all the staff to be informed about a conducted survey among employees. This will be a commuting survey as to the methods of commuting and possible alternatives. The result of the survey will be used to design the invention of transportation program that will reflect the desires and needs of the company. 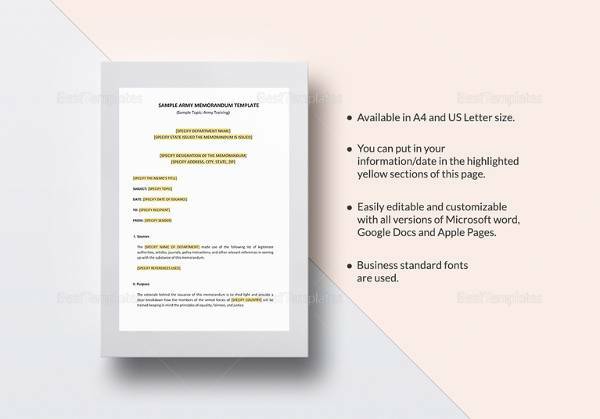 This memo template is designed for the Office of Accounting with the logo of Department of Finance and Administration. This contains the personal information including basic data, remit to, tax and withholding, one time vendor data, payment data, manual check only and expense detail. This is also commonly known as a direct invoice or credit memo. 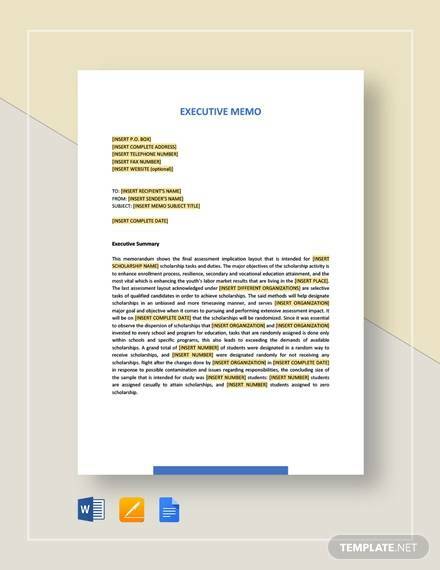 This memo template has a very clean and simple format. 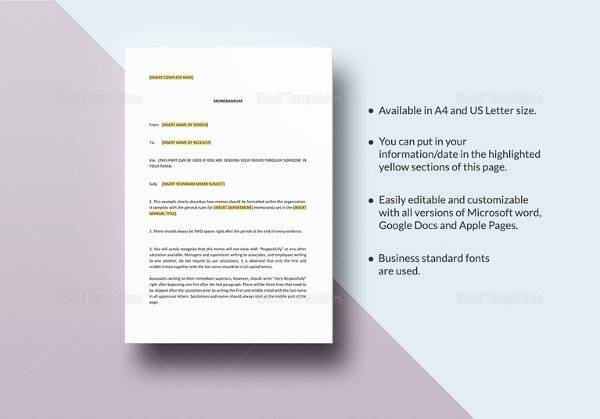 The letter contains the Company name, Company address, Date of memo, Recipient of the memo, Writer of the memo, Subject, Body of the memo and the attachment (if there is). This is pretty simple but important. It has a plain text without any logo of the company. It is plain and simple; however professional on its way of a written memo. This template is a free memo. Any establishment or business can make use of this template. 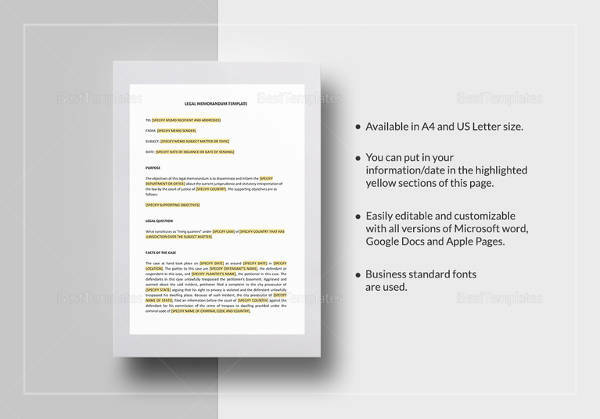 You will see a simple, clean and professional memorandum letter. This is very plain and simple. It is outlined with recipient of memo, sender of memo, date, subject, body of the memo and any additional info. You can simply make use of this editable file easily and for free. This template is a legal memo. It is outlined through the following: recipient of the memo, sender of the memo, subject, date, body of the memo including the question presented, short answer, statement of facts, discussion and conclusion. This memorandum letter is very simple yet very detailed. 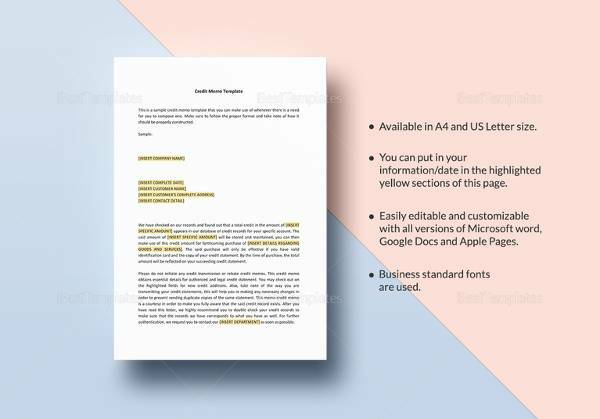 It is clear and readable, which enables the recipient to understand instantly the details cited on the body of the letter. This is a legal formatting document. 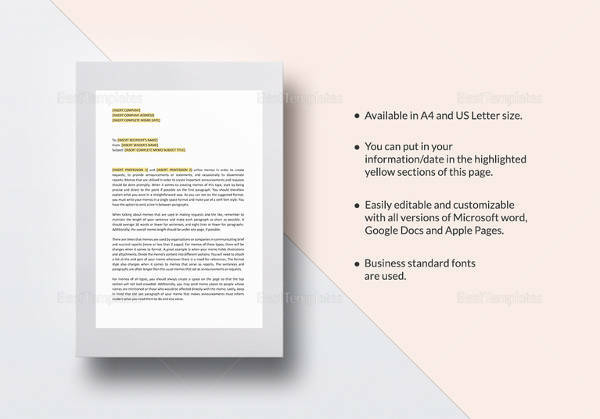 This letter memo template is a common type of business communication. This is very relevant for communication and in the world of business writing. This memo is generally used within an organization. This template has a plain and simple format. 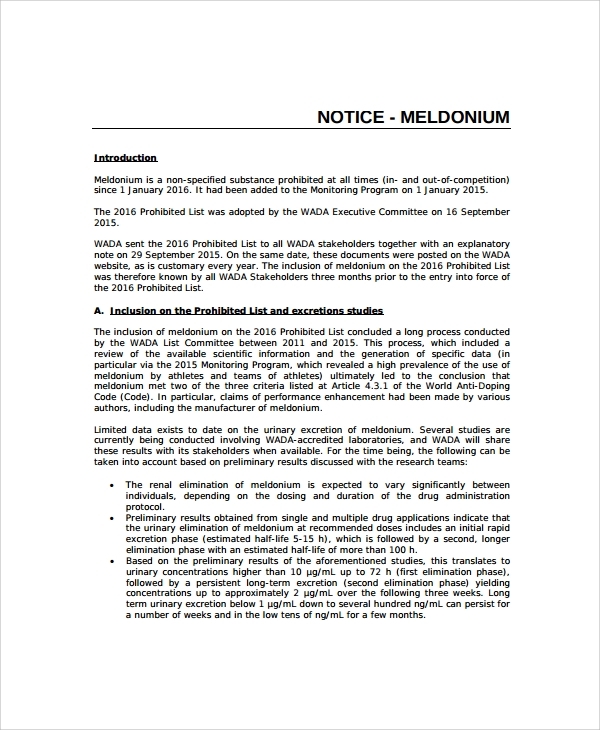 A simple text on the top left “Memorandum”. Below the Memorandum follows the date, recipient of the memo, and sender of the memo, subject and the body of the memo. 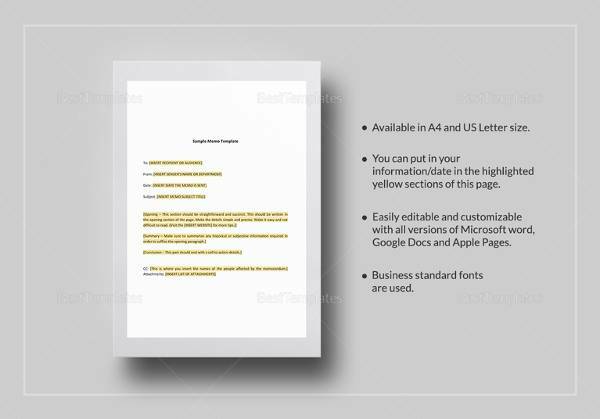 This memo template is released by the Department of Energy and is signed by the Inspector General. It has a subject about information for the external peer review on the Office of Audits. 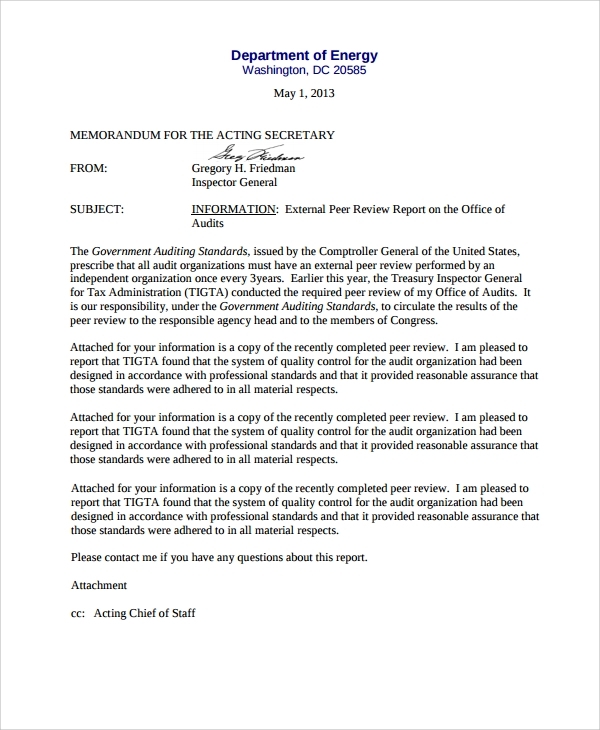 This memorandum letter is to inform that all audit organizations should perform external peer review on the said schedule. This template is designed for budget operations. 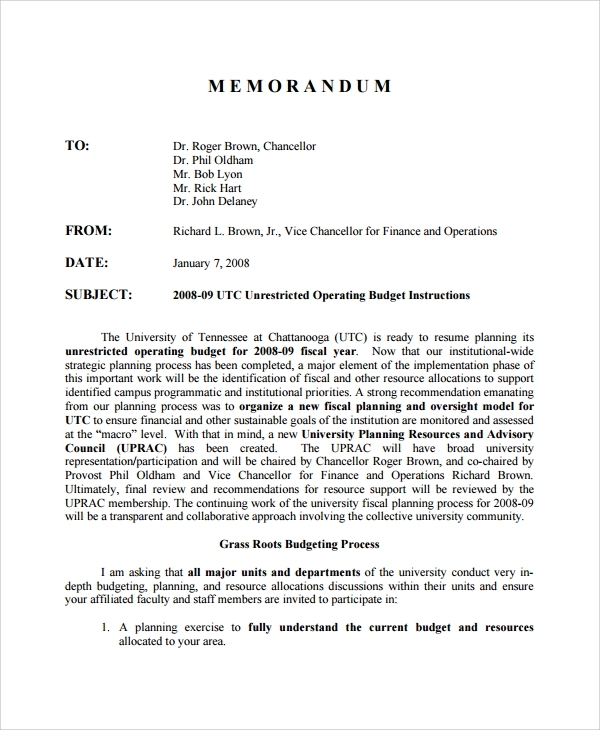 This memo letter states about the cycle of the budgeting process. Budget discussions will be explained with the other participants, so that all of the people who are engaged on the budgetary will become aware or get informed. This letter has a lot of considerations to tackle and a lot of things to be discussed as to the budget processing involved. 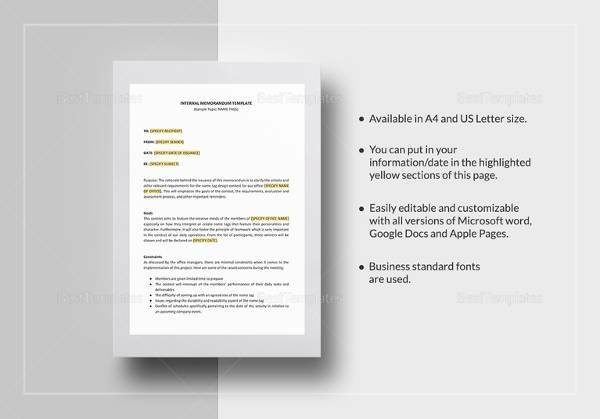 This template is a corporate memo addressed to another company. The letter talks about a transaction between two companies that announced a transaction regarding business collaboration. This will be a friendly transaction of two companies agreed to combine forces and earn together on the same product or service. This memo talks about the conditions of both companies as to the systems upon consumption and approval of the transaction. 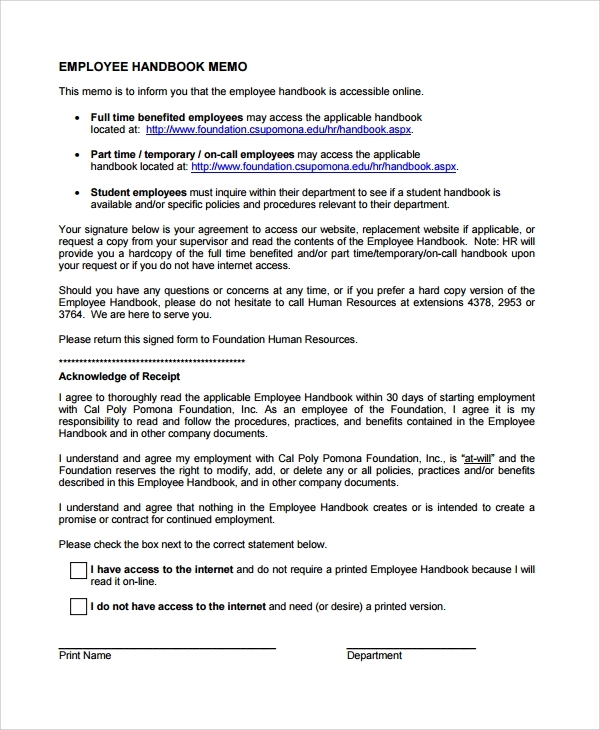 This template is a memo for full time employees, part time employees and even student employees. This is a memorandum letter explaining to all employees about the right to add, delete or modify all or any policy, benefits and practices. 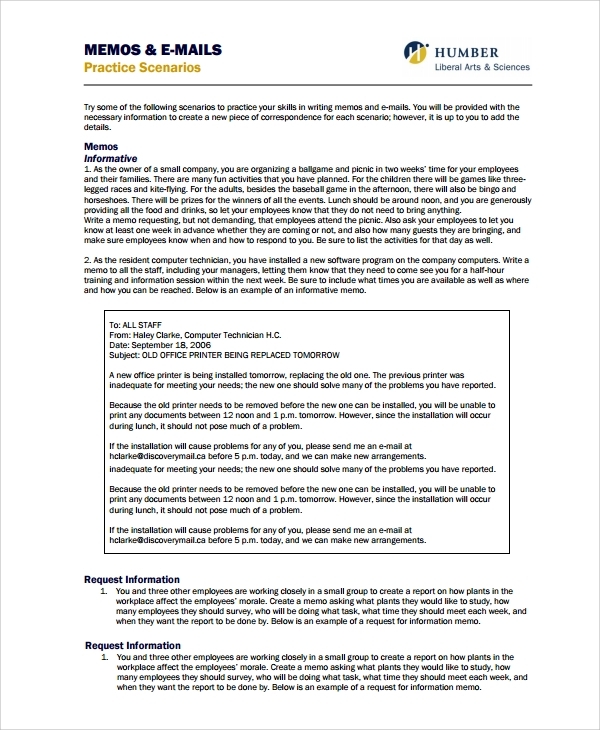 This memo letter also informs that the employee can create or contract or promise for continued employment. This template is an email memo. 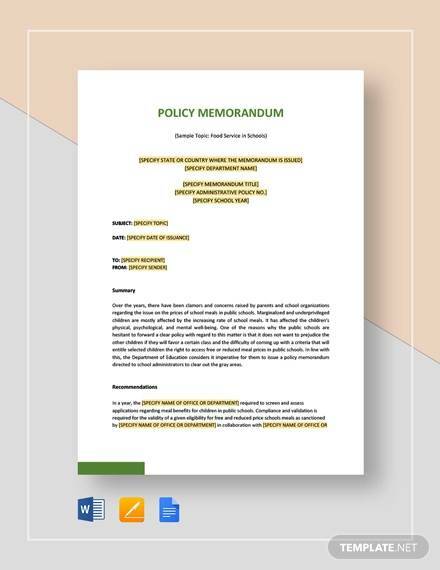 Any change or any policy that will be modified in a company is stated in this memo letter. This is to inform the employees about the details of the company and any change or plan for the increase of productivity will be written and delivered in this letter. This template outlines recipient of the memo, sender of the memo, date, subject and the body of the memo. This template is clean, simple, uncluttered and with layout. 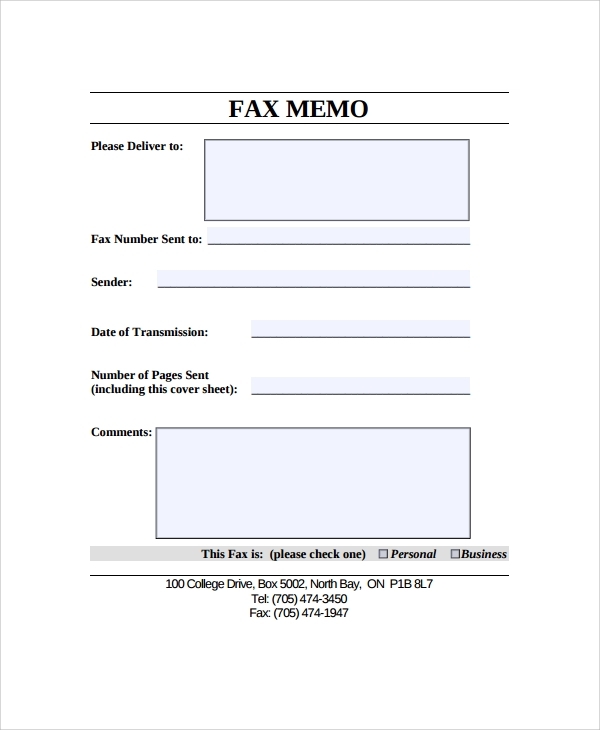 This fax memo is not a plain text but it has boxes used for the memorandum to be filled up. It has a big and bold logo and company name on top. Under the company name and logo, there is a bold letter “Fax Memo”. 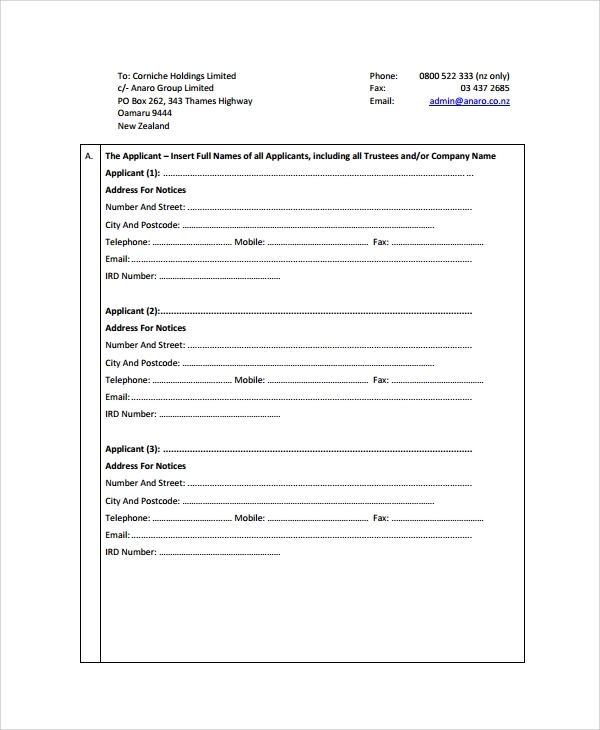 The form is to be filled up the following: please deliver to, fax number sent to, sender, date of transmission, number of pages sent and comments. Under the form, you should check either personal or business fax. At the bottom of the template will be the address. 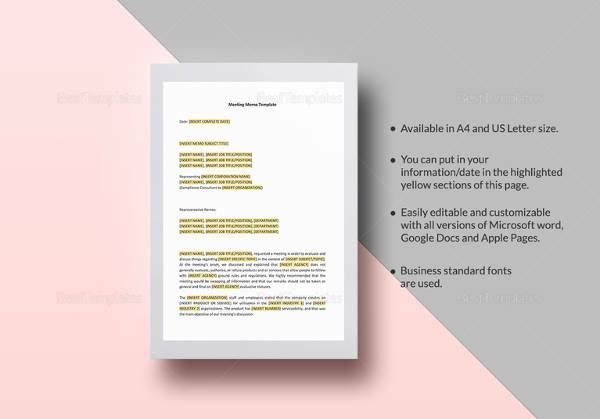 This template is a government memo with the logo on middle top. This has a very professional layout, outlined with an organized format. This memo is a very long memorandum letter that discusses about executive summary, factual background, litigation background, order and opinion, committee’s appeal, justice department production, going forward and the timeline of key dates. This memorandum will be a long statement letter regarding the system of the government concerning the republican members committee. This template is very much professional. It has the logo of the school or company. The memorandum letter is outlined by the following: recipient of memo, sender of memo, date, subject, body of the memo stating about the list of holidays. The letter is pretty simple yet applicable for schools and even companies. This will inform the whole institution for the incoming holidays to get prepared. 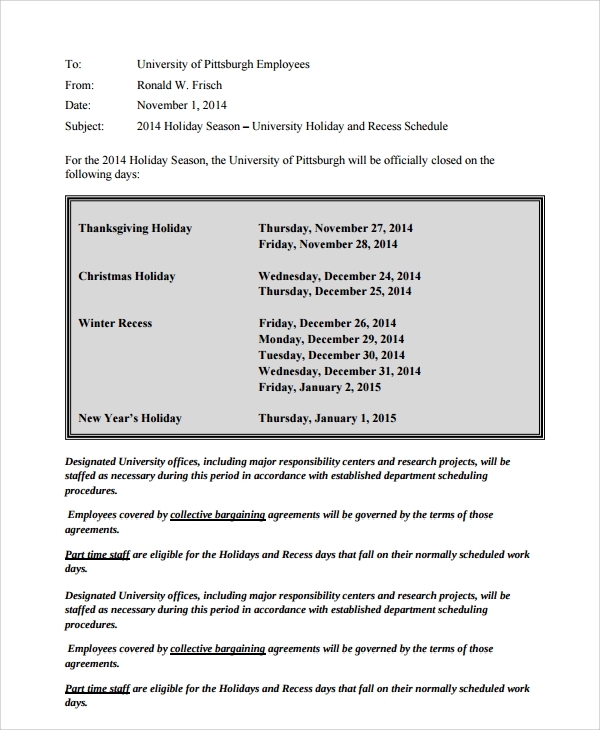 This is very important for all institutions as holidays are active every year. 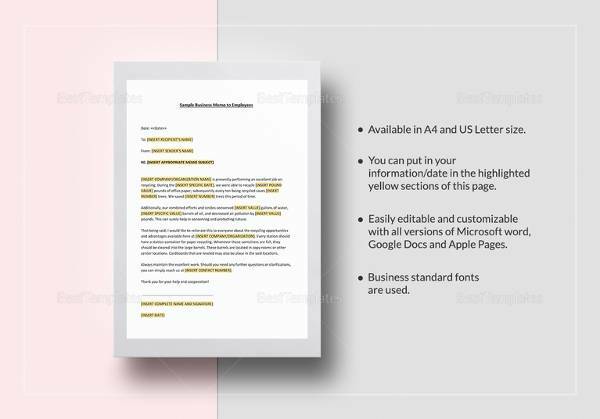 This template is an investment memo about a company that proposes to set up an investment company or even manage it. Since setting up an investment company takes a lot of considerations, you need to make sure that everything are prepared. You need to take close onto the current situation of the market before deciding of building up a company. Thus, you need to extract an investment memo in order to set out a memorandum on the key terms of the proposed investment together with the application form for those interested investors. 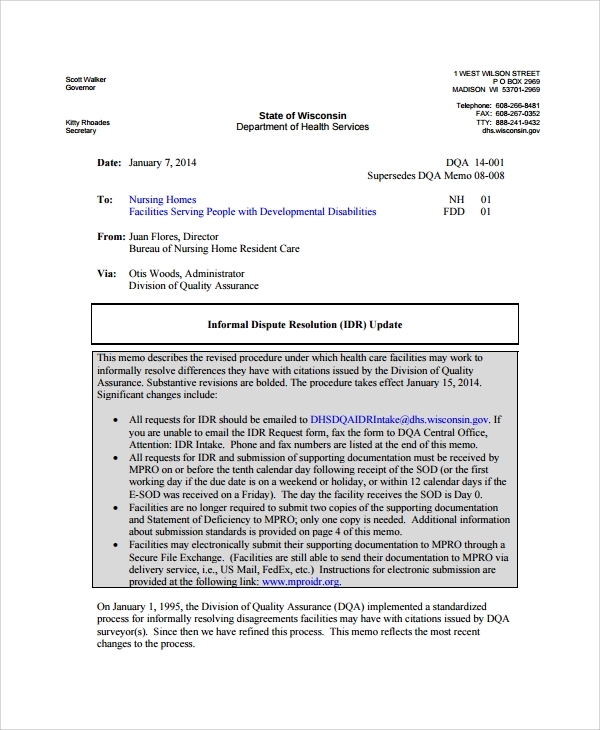 This template is an informal memo with the logo of the Department of Health and Services. It discusses about the revised process which will takes effect on the designated date. This is a very detailed and long procedure that should keep an eye on. 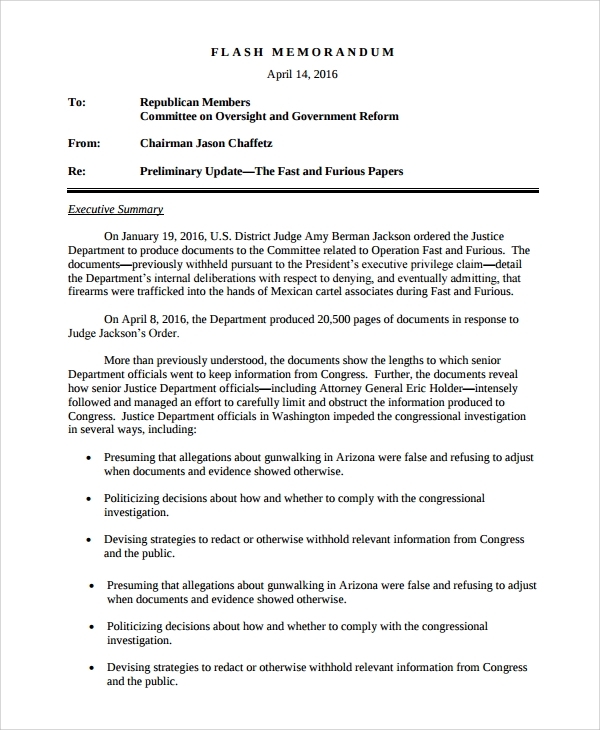 The memo informs the party that there should be following procedures that need to be followed. Generally, the memo focuses on the IDR (Informal Dispute Resolution) request. Of course, there must be the approval of another party that is assigned to approve the memo letter. 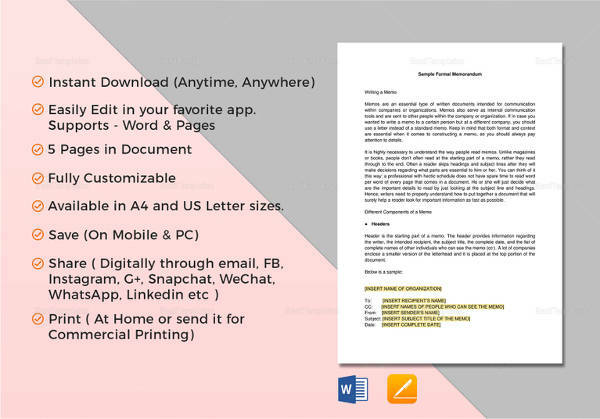 This template is a memorandum to inform the students regarding their hours of work on the job. This is outlined with the recipient of memo, sender of memo, subject, and body of the memo, student’s name, signature and the date. 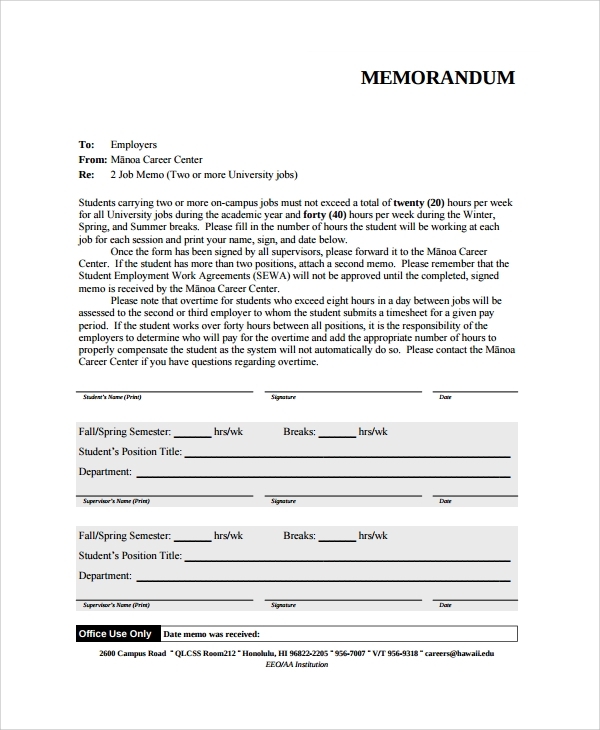 A highlighted form under the body of the memo includes the semester and hrs/wk, breaks and hrs/wk, student’s position title, department, supervisor’s name, signature and date. For the next highlighted form will be the student’s details of semester and hrs/wk, breaks and hrs/wk, student’s position title, department, supervisor’s name, signature and date. This template is a notice memo that might sounds familiar to you. Any business is informed about this type of memo. Business activities should follow a process under the memo released by the company head. This is very detailed and well explained. When do I need Memo Templates? 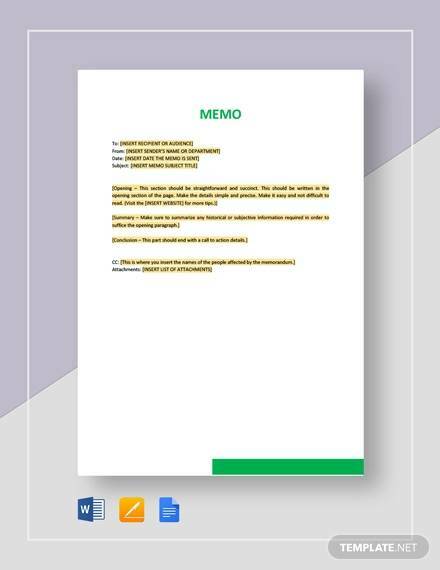 You will need a memo template once you will deliver a specific issue, reminder, encouragement and policy. 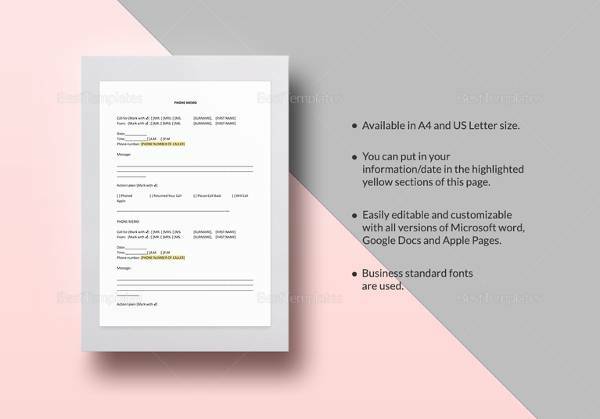 Most companies make use of this template for their business partners and customers. This template is formal when you give an announcement or reminder to the public. In most cases, business or firms are making use of this powerful template as mode of communication to the crowd. This template is so much interesting. You are able to deliver your message using this letter. 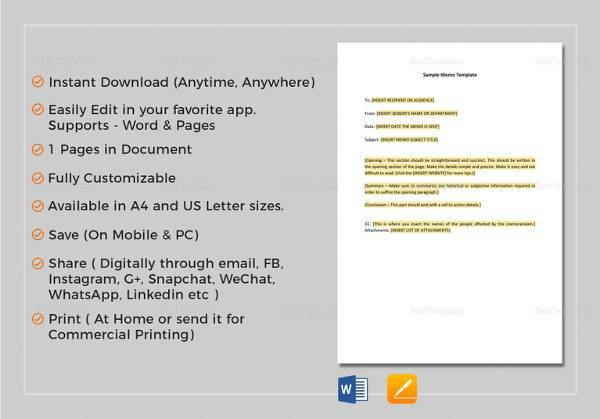 There are different format of memo to make use of. It only depends on what format you choose and you think best for your needs. Each of this format has an specific feature that fits your needs, so that you would preferably pick a specific format. How to Create/Write Memo Templates? These templates are available in different memo format. You can start to make use one of these templates depending on the type of memo that you want to use. 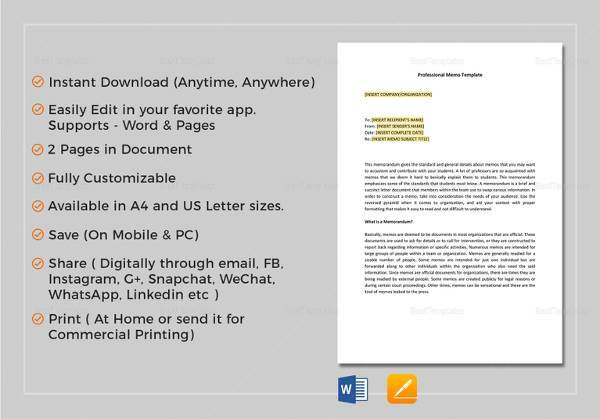 All of these memo examples are available in doc and pdf files. You can start to search the customizable and professional templates and download them. There is no problem in downloading the files as they are all offered for free and printed ready.